I made a clock based on Galadriel’s Hall in Lothlorien, you can see the pattern below if you want to copy it, but you can make a clock in whatever style or race you want. Foam core board, no more than 6mm (1/4 of an inch) thick (any other backing is fine if it’s not too thick). Cut out a foam core backing for your clock. This can be any shape you want depending on what style you’re doing. The size depends on how long your clock hands are. Leave a good amount of space around where you want the numbers to go. I used a curved, sort of bullet shape for my backing. Cut out a small round hole in the middle of the backing, making sure the part of the mechanism that the hands click onto fits well into the hole. Cut out various shapes from the heavy card to build features on your clock. 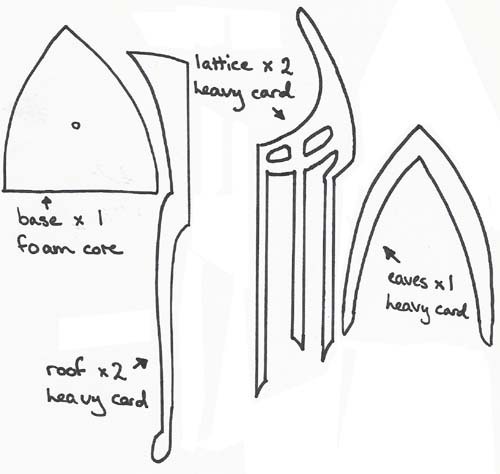 For mine, I cut out a roof, eaves and lattice-shapes for mine, see the pattern I included. When you have the pieces you want, paint them in colours according to your theme. I used silver paint as a base colour, and used darker and lighter colours of silver brushed lightly over this to give it texture. I used an antique finish gold colour for flourishes and details. Now, for the numbers. You can look up Elvish numerals if you wish, or just include any Elvish letters that mean anything special to you. Or you can write English numerals in a Tolkien-esque font. Mark out where you want the numbers to go. Measure out 30 degrees between each number, to make sure your clock keeps time correctly. Hot-glue all your pieces together. You may want someone to help you hold the pieces still if you use bendy ones. Decorate with any other bits and pieces you want; frosty, fine glitter or tassels or beads, whatever you want. Push the clock mechanism through the hole from behind, and fasten with a bolt and washer, or any fastener it came with. Attach the hands, usually they just clip on. Always attach the hands pointing at 12 o’clock, that way you know they’re positioned right. You don’t want the short hand pointing halfway between 9 and 10 when it’s 9 o’clock, do you? It would get very confusing. Most clock mechanisms come with a hook, but if it didn’t, attach one to the back of your clock so you can hang it up. Insert a battery, and there you go! You have your very own Middle-earth clock!